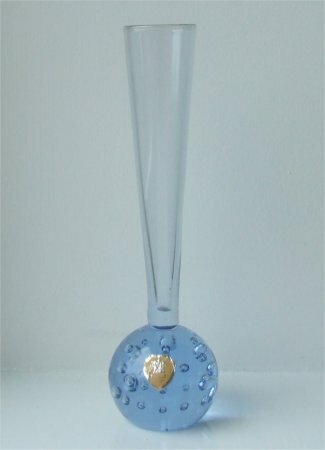 This pale blue based vase is approximately 140mm (5 & 1/2") tall. It has large bubbles going around the base. The bottom of the base has a flat and polished finish. 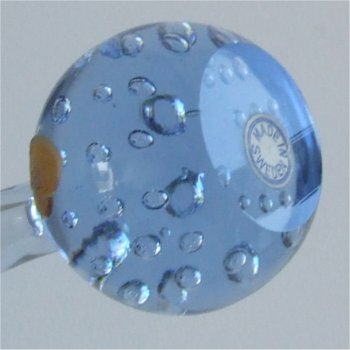 The stem is the same colour as the base and has a wide flare of approximately 25mm (1 inch) across the top. 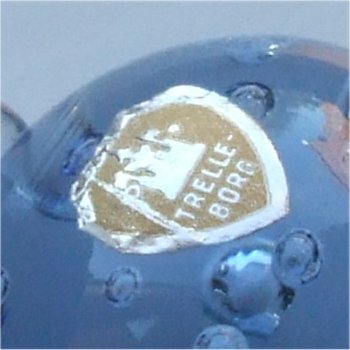 The paper label is a shield shape and a buff/yellow colour with silver writing and a picture of a castle which states "TRELLE-BORG" (see images below). Trelleborg is a town in Sweden. There is also a small round, white paper label on the base with blue writing which states 'MADE IN SWEDEN'.